The General Electric Fuji Electric 6KG1143010X1B1 is a 3 phase 10 horsepower controller. The drive a member of the AF-300 G11 drive series. 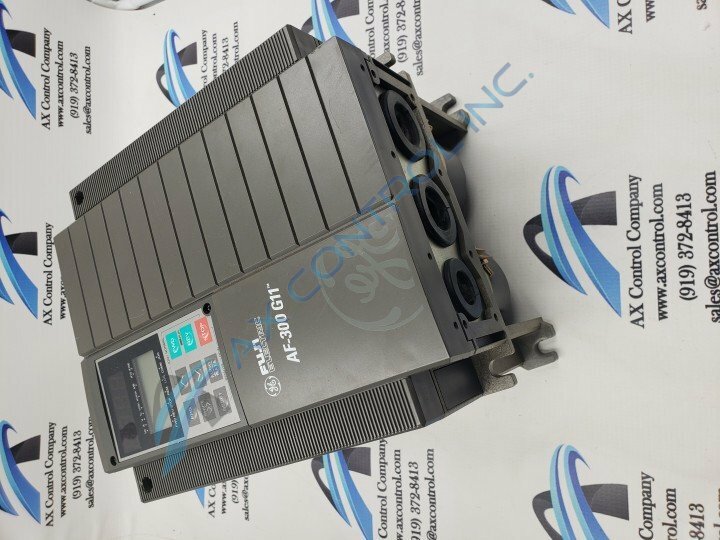 A variable frequency inverter, 6KG1143010X1B1 can input up to 460 volts with a frequency of 50/60Hz. The drive can output 380/460 volts with a frequency of 0.1-400Hz and has a rated output current of 18 Amps. The drive includes a factory installed keyboard panel. The drive is housed in a NEMA 1/ UL Type 1 enclosure, measuring at 10.24in (H) x 8.66in (W) x 7.68in (D) with a weight of 14.3lbs. The front plate of the drive can be removed by loosening the mounting screws located on the front of the panel. Once the front panel has been removed, the factory installed keyboard is easily accessible for removal. 6KG1143010X1B1 must be stored indoors in a condensation free environment. It is imperative that the drive be completely insulated to protect from moisture and condensation, both of which can corrode the capacitors. The operating facility temperature must be between -10℃ to 50℃, or 14℉ to 122℉. If the temperature in the operating environment is to exceed 40℃ (104℉), then the ventilation covers must be removed to prevent overheating. When installing, refer to the specified instruction book for proper safety installation methods. The driver and heat sink must be kept clean of all debris or matter to prevent fire or accident. The heat sink may reach temperatures upwards of 90℃ or 194℉ while the drive is in use. All products we sell are backed by our unparalleled warranty. AX Control Inc. sells new surplus and reconditioned products. This website is not sanctioned or approved by any manufacturer or tradename listed. AX Control Inc. is not an authorized distributor or representative for the listed manufacturers. Designated trademarks, brand names and brands appearing herein are the property of their respective owners.